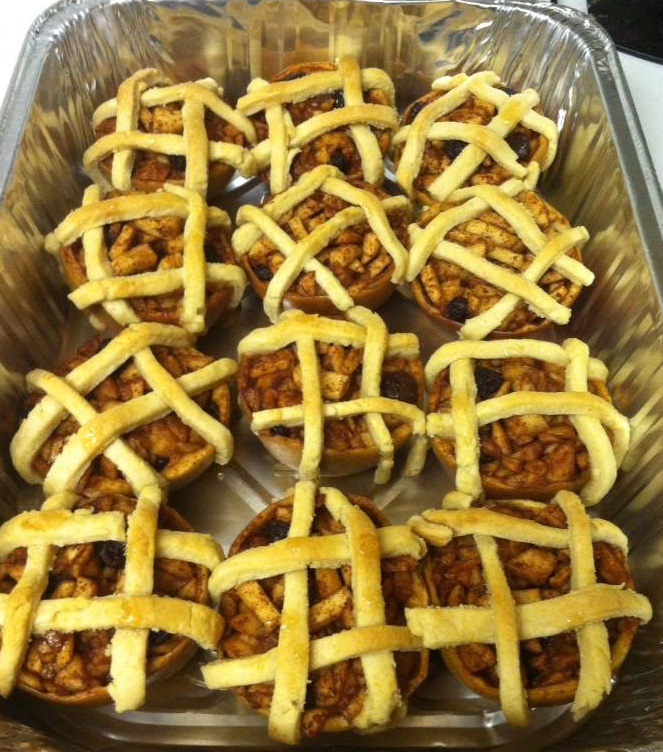 My sister makes these delicious apple treats all the time for my kiddos (and everyone else). Think an awesome healthy version of an apple pie. Since they are such an unbelievable hit (they have even caused a name change ;)) we wanted to share them with you! Perfect time for the Autumn and Jewish Holidays too! My kids will eat these at any meal, any time of day! Enjoy!!! I’m Marisa’s sister Jillian, but my wonderful niece and nephew know me as Aunt Apple. I started making my special apple dessert about two years ago, and they love it so much, I give it to them for every family get-together. It’s vegan, very low fat, low sugar, low carb, high fiber, and most importantly, it’s delicious! The very first thing you want to do with this recipe is make the dough for the crust; the more time it has to hydrate, the easier it will be to work with. Mix the Bisquick with the Crisco and boiling water, then knead it all together. Wrap it tightly in plastic wrap and put it in the refrigerator. The next step is to plump the raisins. You can do this really easily by microwaving the raisins for two minutes with half a cup of water, then draining whatever water is left. If you want the raisins to be even sweeter, you can use fruit juice instead of water to plump them. Then, you take the apples and cut them in half horizontally. Then, using a sturdy melon baller, scoop out the core, making sure not to puncture the skin of the apple. After you’ve thrown away the core, use the melon baller to scoop out as much of the fruit as possible, and set it aside for the filling. When you’ve hollowed out all the apples, roughly chop all the scooped out pieces, and mix them with the sugar, brown sugar, cinnamon, salt and raisins. Toss everything thoroughly to combine. Now, fill each of the apple with the filling up to the brim. Next, take your chilled dough out of the fridge, and roll it out on a non-stick surface or a floured surface. Slice it into thin pieces about three inches long for your lattice crust. And then make a little hashtag on each apple half. Gently press the ends of each dough strip on to the apple. When these are all completed, put them in a casserole dish. Now, pour a tiny bit of water on the bottom of the dish between the pies, cover the whole thing with tin foil, and bake at 375 degrees for 20 minutes. 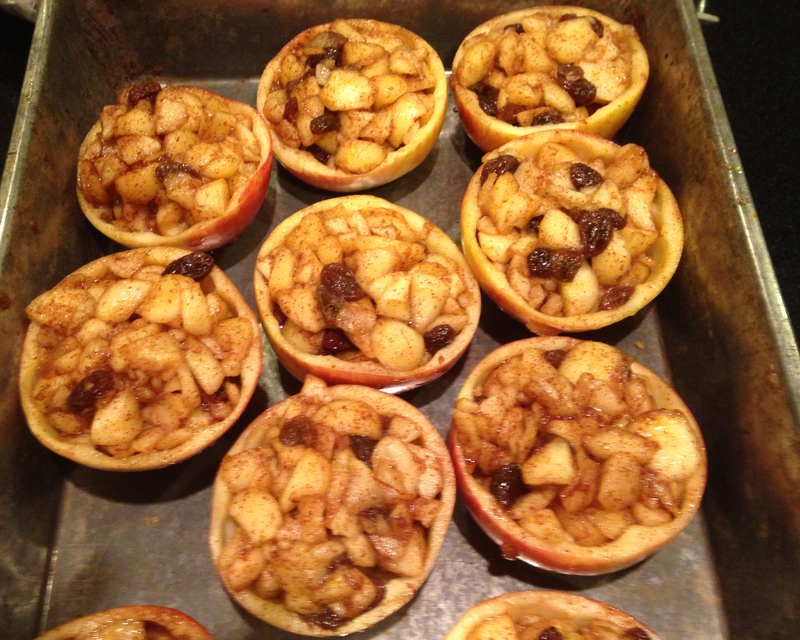 Then uncover the pan, and cook the apples for another 20 minutes, or until the crust is nicely browned. You now have your very own Aunt Apple’s Apples! There will probably be some water left at the bottom of the pan, so move those treats to another vessel, and enjoy!